Born in Vancouver, B.C. in 1953, Della's primary interest from early childhood was art. In the 1960's she studied visual and performing arts with David Orcutt, founder of the experimental Intermedia Group, whose Balinese puppetry first explored the show worlds that later beckoned her. Working with Tony Onley, a well-known and respected Canadian artist, she visited his landscapes as they were in nature, witnessed their transformation into abstract paintings in his studio. 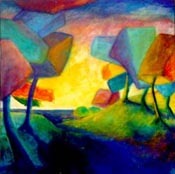 Ever since, landscapes have been an important part of her repertoire. Della attended Vancouver's Emily Carr School of Art and Capilano College where she studied lithography, metal etching, linocuts, serigraphy, drawing, sculpture and carving, in addition to painting. In her development as an artist, Della was much influenced by the Impressionists and Post-Impressionists, whose love of light, intensity of color and immediacy of gesture taught her to be unafraid. From the Surrealist School she gleaned an appreciation for dream-like realities, but always her rapport with nature brought her again to use those simple elements in her visions. It was through her meeting with artist E.J. Gold that she contacted the intangible; that which gives life to painting; which imbues a canvas with the ability to shift expression, and has since become one of the most accomplished members of his School of Reductionism. Any knowledgeable observer will note Della's mastery of technique. Her ability to draw, her deft use of light and the spectacular intensity and effectiveness of her palette are immediately evident. 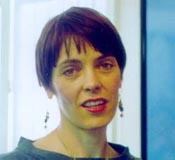 But technique is not what ultimately distinguishes Della Heywood as an artist. Rather it is her vision which is arrestingly bold and original. This vision has been hard won and is therefore authentically her own. The vibrancy of the scenes in her painting attest to this. She has been to other worlds, not simply figments of the mind but tangible realms of sensation and emotion, transfigured into form by the creative imagination. Hers is not the imagination of fantasy circling around unresolved personal needs or subjective memories. This is the imagination that creates, clothing in appearance the formless perceptions and feelings of an unconditioned aesthetic awareness. Thus the startling freshness of her work. For Della, these visions are the end result of a long quest, conducted with the help of a shaman teacher. Her quest's objective: to strip away habitual cognition and enter into the magical world behind and within ordinary perception. She has documented this quest in her paintings, most of which have been quickly purchased by private American and Japanese collectors interested in her journey. Della now lives in California where she is one of the principal artists of the Grass Valley Graphics Group. "The finest instrument of any artist is herself. Awakening this instrument is the key to painting. This awakening is achieved by the directed use of attention. Most observers may think this attention should be directed outward toward the subject matter of the painting but this is not so. The attention must first go inward to enhance perceiving, sensing and feeling. These are the inner palette on which artistic experience is registered. This palette must be cleansed and sensitized to enable it to participate in the subtle and the new. Habitual responses must be unlearned. This is the inner method of shamanism and it lends itself well to art. This is how the artist becomes an instrument for art . . . by stripping down to the essentials, losing parts of herself. The end result is that the artist can step, whole, into other realms, using feeling and sensations to orient within them and obtain a clear reading of what is there. To me, an artist is not made by accumulating experience. The artist is pure perception. In terms suitable for the computer age, art is real time imaging without memory. The creative act is always in the present moment. I turn my attention to a certain place...a real place, not something surrealistic. I open myself to the feeling of that place and it impresses itself on me, sensation by sensation, perception by perception. As I capture them, the painting emerges."